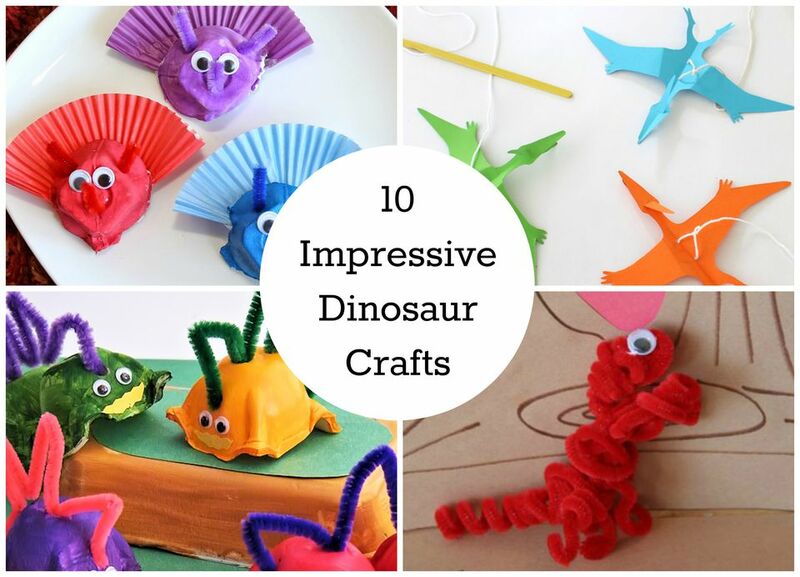 Dinosaurs are interesting, educational, exciting, and tons of fun to use for craft time with your kiddos. All of these crafts use simple supplies and don't take more than an afternoon to whip up together with your little ones. Which one will you choose to make? Check out these little dinosaur pipe cleaner toys. These are super easy to put together and can be made in minutes. The best part is once you make them, your kid can play with a few new dinosaurs together. They are perfect for afternoon playtime! This is a happy little dinosaur. It's really simple so even the littlest crafters can make it. Paint the popsicle sticks green and glue them together and you'll have your very own popsicle stick dinosaur. Recycle your old egg cartons by turning them into roaring egg carton dinosaurs. Use pipe cleaners for their spiky backs. Once you make a few, your kids can enjoy building a dinosaur landscape for their new creatures. Crumple up pieces of tissue paper and glue them together to make this tissue paper dinosaur craft. Use green tissue paper or whatever color you'd like. Will you believe that you can make an awesome DIY cardboard box dinosaur from a single cardboard box? Imagine how much fun your kids will have making and playing with this. This project is definitely a keeper and will result in hours of fun for your kid. The steps aren't that hard and are suitable for your child to help along the way. Learn all about a triceratops with this simple craft. Little crafters will really enjoy how easy and fun this project is. Use different color cupcake liners, egg cartons, and pipe cleaners to complete your egg carton and cupcake liner dinosaur. Teach your kids about how dinosaurs are born with a paper mache dinosaur egg project. Using a balloon will allow you to create big, dinosaur-sized eggs. Turn bath time into the best part of the day with this exciting dinosaur egg bath bombs project. Your kids will go crazy over these. They will love watching the egg dissolve in the water and the dinosaur "hatching" out of the eggs. Make your dinosaurs fly around your house with these paper pterodactyl dinosaur puppets. All you have to do is attach the cut out dinosaurs to a piece of string and a stick and they will be zooming through your home in no time.